Where: Alex Box Stadium – Baton Rouge, La. This is the No. 1 team in the nation, so LSU has playmakers up-and-down the lineup. Much like Texas A&M, the Tigers have seven players in the batting order hitting above .300. Their .320 team average is the best in the SEC, four points higher than A&M’s .316. Catcher Kade Scivicque leads the way with a .396 average hitting in the five-hole, while Mark Laird is hitting .354 with a whopping 40 runs scored in the two-spot. In fact, every player in the two through seven spots in LSU's order is hitting over .329. Thus, the offensive production is very similar to the Aggies’ offense. There’s no break in the lineup for Texas A&M pitchers; it’s going to be a grind for all 27 innings. But that’s not all. LSU also has speed and it will be aggressive on the base paths. The Tigers have stolen 73 bases in 92 attempts; the first three hitters in LSU’s lineup (Fraley, Laird, Bregman) have combined for 50 stolen bases. By comparison, the Aggies have swiped 28 bases in 38 attempts. So A&M’s hurlers must keep the top part of the order off the bases, which is easier said than done. LSU’s pitching is very good with a team ERA of 2.86, which is slightly higher than Texas A&M’s 2.40 ERA. The Tigers have two excellent frontline starters led by freshman sensation Alex Lange, who is undefeated at 7-0 with a salty 1.40 ERA. Jared Poche’ will start the Thursday game and his numbers are solid at 7-1 with a 2.90 ERA. LSU has struggled with the Sunday starter spot and will give the ball to freshman Austin Bain (1-1, 3.07) who will be starting only the third game of his collegiate career. Jesse Stallings has been an effective closer all season with 11 saves and a 1.88 ERA. Calling this weekend’s series a challenge for the Aggies is an understatement. On paper, LSU looks every bit the part of the No. 1 team in the nation. Add in the fact that Alex Box Stadium will be raucous and suffocating, and this is as difficult a series as you’ll find in college baseball. 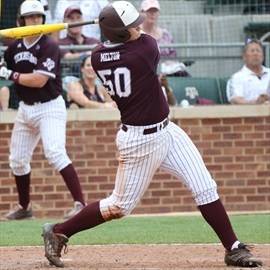 Then again, the Texas A&M baseball team is no pushover either. That’s why this series will be a clash of titans. The Aggies have their own murderer’s row with Nick Banks, Mitchell Nau, Logan Taylor, and Hunter Melton in the two, three, four and five spots all hitting over .349. The Aggies lead the SEC in home runs with 40, two ahead of LSU. Including Blake Allemand in the leadoff spot, it’s clear that for A&M to have offensive success in this series the top of the order must hit well and deliver a majority of the production. The LSU staff is too good to serve up many mistakes and it will be up to the team’s best hitters to get the job done. On the mound, Rob Childress will stick with veteran Grayson Long for game one. Long has been solid as a rock since his second outing of the year and he’s pitched in some of the toughest SEC venues in his career, so the Aggies need a quality start from the Barbers Hill native — and he needs to give the team seven innings, which he hasn’t done consistently due to pitch count. Ryan Hendrix stays in the game two starting spot despite an up-and-down first weekend start against Arkansas last weekend. He draws the dominant and undefeated Lange, so Hendrix will have to be impeccable to win Friday’s start. Childess did not name a starter for game three, and he’ll play it by ear as the series progresses. The likely choices will be either Matt Kent from the left side or Kyle Simonds from the right. The better question is, what’s not at stake this weekend? It doesn’t get any bigger than this in the regular season. This is No. 1 versus No. 2, and it’s been a long, long time since a major Texas A&M sport was involved in such a clash of top-ranked teams. This is the weekend series of the year not only in the SEC, but across the nation as well. Aside from the glitz and glamor of the two top teams squaring off, there’s a lot riding on this series for a number of reasons. The winner takes the inside track for the race to the SEC title. But most importantly for the Aggies, they are gunning for that top eight national seed. 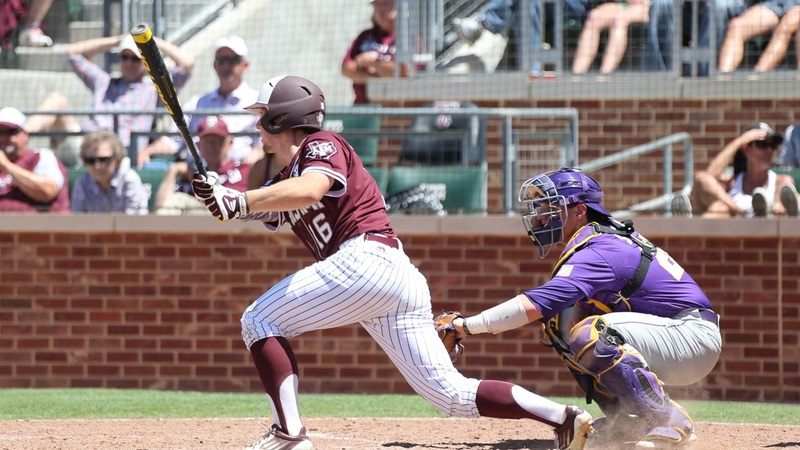 Win the series in Baton Rouge and Texas A&M is all but guaranteed home field advantage in the NCAA regionals barring a complete collapse down the stretch against Tennessee, South Carolina and Ole Miss (which is very manageable). Drop the series and the Aggies have work to do to keep that national seed. It would also drop them closer to the pack in the SEC race and fighting for a bye in the SEC Tournament. So, everything is at stake — and that doesn’t take into account that it’s the Aggies and the Tigers, which is always a heated series regardless of the records and circumstances.